HomeNational NewsTrump’s Border Emergency Order: Brilliant or Betrayal? From AFP’s executive editor . . . In AFP Issue 11&12, mailed out Feb. 22 and posted online for digital subscribers, we did something a bit different than usual. Instead of a lengthy special report on pages 16 and 17 in our center-spread, we are publishing a kind of debate, which explores both the positives and negatives of President Donald Trump’s efforts to secure funding for a wall on America’s southern border. Everyone knows that, for the past few years, Trump has been demanding billions of dollars to build a border wall. His original plan called for taxing all of the remittances that were being sent home to people in Mexico and Central America in order to fund the construction. On the campaign trail, that is how he explained he was going to get those countries to pay for increased border security, but even the Republicans—his own party—fought him on that, and he was eventually forced to go to Congress to ask for taxpayers’ dollars to pay for the project. Of course, the current House of Representatives, which is controlled by Democrats, balked at the president’s request, prompting a showdown between the two sides. In mid-February, facing yet another government shutdown over the fight, Trump and the Democrats agreed to a massive funding measure that would keep the government open but would provide only a few billion dollars to continue border wall construction. On the one hand, AFP writer John Friend blasts Trump, arguing that the president caved much too early in the funding battle. Trump let down his base of supporters, remarks John, who then reminds readers that the president had promised from the very start of his presidential campaign that he would make securing the country’s border a priority. Trump was the one who blinked first, says John, losing out to Speaker of the House Nancy Pelosi (D-Calif.)— all because he didn’t have the fortitude to stand his ground and shut down the government in his battle with the Democrats in Congress. On the other side of the argument, our roving editor Mark Anderson argues that Trump is actually a master tactician and negotiator, who has managed to outwit Pelosi and the Democrats. Mark contends that Trump knew he would never get all of the money he asked for, so instead Trump demanded billions more than he actually needed. When the Democrats finally reached a compromise, Trump was handed billions of dollars less than he originally sought—but we shouldn’t look at this as a loss. At that point, Trump was able to declare a national emergency on the border, nabbing even more money than Congress would have ever appropriated for the job—clearly a win for the American people. Please read these two articles below carefully and let them sink in, then take a moment to pick up a pen or sit down at your computer and send us a letter to tell us what you think. Did Trump lose this fight and fail to get what America needs to lock down our border? Or do you believe Trump actually out-maneuvered and out-negotiated the Democrats, ultimately getting even more than he originally asked for? Finally, would you consider this a win for the American people, or is it yet another loss for this once-great nation? Many of you already write to us on a consistent basis, providing much-needed feedback on our work and giving us tips on news stories that we should be covering. We can’t tell you enough how helpful this is. We want to know what you, out there in the streets, are seeing and hearing, because we all know we can’t trust the major media or even our own government to tell us the truth about what’s going on in the world today. Our mailing address and online contact form can be found at our Contact Us link, here. People are increasingly afraid to speak their minds, fearing they will be accused of spreading hate and will be mobbed by activists. In many parts of the country, you can’t even wear hats or t-shirts that show support for the president out of fear that you will be physically assaulted. Take a stand for our country, and speak your mind. 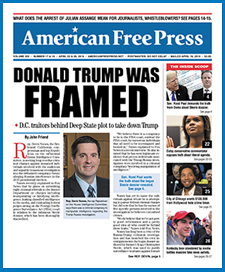 We can’t think of a better place to do it in than American Free Press—the last truly free newspaper in the United States. Send Us Your Opinion . . .
We’d like to hear from American Free Press readers on this issue. (Click here.) In a poll we conducted several years ago, illegal immigration was the No. 1 concern of readers. Do you think President Trump has surrendered on border security? Do you think that he should have refused to sign this bill? Are his critics correct that his immigration policies are in reality very different from his predecessors? How should he have proceeded? Did he actually get what he wanted? Do you agree that this situation warranted a state of emergency declaration? Trump signed the bill on Feb. 15 and immediately declared a national emergency because the bill did not contain enough funding for border security and a border wall, sparking outcry and outrage from leading Democrats and other leftist activist organizations, including the ACLU, which vowed to challenge the president in court. ALIPAC had been an ardent supporter of Trump during the 2016 election season. Due to the president’s lack of ability to build a wall along the southern border, a signature campaign promise, and his increasing willingness to compromise with Democrats, ALIPAC has joined a growing chorus of former Trump supporters that has come out to criticize the president and his handling of the immigration crisis plaguing the nation. “Trump just signed into law a bill that 99% of Americans know nothing about, which contains amnesty for millions of illegals, incentives for child trafficking, an expansion of Trump’s deadly catch-and-release policies, less detention space for illegals, reductions of interior immigration law enforcement, new buildings and buses to bring more illegals into the U.S., raising of legal immigration levels, a measly $1.3 billion for border fences, and severe restrictions on where border barriers can be built,” ALIPAC declared in a recent press release. Gheen’s criticism of Trump did not stop there. Columnist Ann Coulter, another former strong supporter of Trump who has been increasingly critical of the president in recent months, voiced her outrage at the spending bill and subsequent declaration of a national emergency. Coulter warned that “it’s over” now that the president signed the spending bill, which essentially amounted to Trump surrendering and selling out his base on the main issues he campaigned on: ending illegal immigration, deporting illegal aliens already living here, and building a border wall to protect the sovereignty of America. Coulter was equally critical of Trump’s declaration of a national emergency, which she largely views as a ruse to placate his supporters. “The goal of a national emergency is for Trump to scam the stupidest people in his base for two more years,” Coulter recently tweeted. She also went on to warn her followers—and the president— that once Trump signs the bill, there are no emergency powers to build a wall. Mark Krikorian, the executive director of the Center for Immigration Studies, a hawkish immigration think tank, published a critique of the spending bill which pointed out that the bill essentially grants local governments along the southern border a veto over the construction of a border barrier in their jurisdiction, tying the hands of the federal government even further. Krikorian also noted that language in the bill prevents U.S. Immigration and Customs Enforcement and other federal immigration enforcement authorities from detaining or removing illegals who have any relationship with an “unaccompanied” minor. Brandon Darby, a leading reporter for Breitbart News who has been covering border issues for the conservative outlet, said that it is “almost going to be impossible to deport” illegal aliens crossing the border “if they have a minor with them” now that the bill is signed. Suffice it to say, some of the country’s leading immigration hawks—once the president’s strongest supporters—are none too happy with the recent spending bill and subsequent declaration of a national emergency by the president. President Barack Obama declared a national emergency 11 times and nine of those emergencies are still in effect, according to the Congressional Research Service. Those included orders related to the security of Libya, Syria, Yemen, Ukraine, South Sudan, the Central African Republic, Venezuela, and Burundi. Two more involved preventing malicious cyber-attacks and preventing terrorist funding. In other words, Obama’s declared national emergencies were focused on the “emergency” security of foreign nations more often than not. President Trump has declared national emergencies four times since taking office. One related to preventing human rights abuses, another was related to the internal situation in Nicaragua, another related to foreign meddling in U.S. elections, and most recently, his state of emergency involving the southern border. The New York Times Feb. 15 edition, in the immediate wake of President Donald Trump’s declaration of an emergency at the southern border—which clears the way for his administration to construct new border-barrier sections and reinforce existing ones—carried no fewer than eight headlines for stories that, in varying degrees, lambasted the president for doing what he feels is necessary to protect the nation’s southern border. While most media outlets cast the president’s move as a surefire magnet for multiple lawsuits, it’s helpful to peer behind such headlines to gain some appreciation of Trump’s actions. Mike King, editor of the popular website “The Anti-New York Times,” sees the matter as a transparent attempt on the part of big-box media to mischaracterize Trump’s border-emergency decision—but the catch is that it appears Trump put one over on the media and on what King calls the “Demonrat” Party. Thus, it’s a safe bet that what Trump did—which the media, tone-deaf to well-honed strategies, failed to grasp—was to purposely ask Congress for much more money ($5.7 billion) than he realistically thought he would get from the normal funding system with the Democrats running the House, in order to actually receive between $1 billion and $2 billion (he got $1.375 billion), while knowing full well that the emergency declaration would net him even more than the $5.7 billion. And it did—$2.3 billion more, totaling $8 billion. Meanwhile, fewer new tax dollars are needed and more existing funds, already budgeted, are being used—funds that evidently were pre-arranged so they could be used for the border. This is a classic case of Trump the tactician at his very best. Those who believe, like House Speaker Nancy Pelosi (D-Calif.) and her ilk, that the border dangers on which the emergency is based are illusory need only recall that some 700 illegal entrants were arrested in the Rio Grande Valley of Texas border sector alone the day after Trump’s Jan. 10 visit to the region—a calculated lead-up to his eventual emergency declaration since his visit, covered by AFP, revealed broad Hispanic-American support for the wall. Meanwhile, informational forums in the valley also covered by this Texas-based AFP writer over the last few years have revealed that people from countries as far away as Pakistan and China are entering the U.S. illegally from the south, besides Central Americans and Mexicans.